Background: Pathologic scarring is a common problem after burn injury that has functional and esthetic limitations. Conservative and surgical treatments available for these scars are not always satisfactory. Extracorporeal shock wave therapy (ESWT) is a noninvasive modality that has proven positive effects on burn scars and wound healing in few studies. This study was conducted to evaluate the effects of ESWT on improving burn scar in extremities. Materials and Methods: This study was a prospective quasi-experimental on burn patients with burn scar in their extremities that underwent ESWT sessions once a week for 6 weeks. For evaluating pain and itching, visual analog scale (VAS) and for scar appearance, Vancouver Scar Scale (VSS) were used. These scales were measured and compared at the beginning of the treatment, at the end of the treatment, and 1 and 3 months after the end of the intervention. Results: In this study, 17 patients were treated with ESWT with a mean age of 37.94 ± 7.25 years that 47.1% of them were male. The mean of VAS score for pain and itching and VSS score were decreased significantly after the treatment and during follow-ups (All P < 0.001). Conclusion: ESWT can improve the pain, itching, and appearance of the burn scar in human extremities in burn patients. Pathologic scarring is a common problem after burn injuries where elastic connective tissue is replaced with inelastic fibrous tissue which makes tissue resistance in stretching and limits its movement and also causes considerable disfiguring. Scar evolution includes contracture scar, hypertrophic scar, and keloids depending on the scar pathology. Pathologic scar after burn injuries can also cause functional limitations and cosmetic issues which has dramatic side effects in patient's quality of life. Recent treatment modalities for burn scar include conservative and surgical treatments. Burn reconstructive surgeries are as follows: free skin transplant, cultured keratinocyte grafting, and using tissue expander with various flap procedure. Conservative treatment includes deep tissue massage which can improve tissue remodeling and prescribing lubricants. Although there are several modalities for burn scar treatment, they are not always satisfactory. Extracorporeal shock wave therapy (ESWT) is a noninvasive modality that studies have shown its effectiveness in urology, orthopedic, and recently in plastic and reconstructive surgery.,,, ESWT is an acoustic wave that mechanically disrupts tissue by cavitation. Remaining tissue provides theoretical bases for neovascularization process and subsequent pain relief., Shock waves develop microscopic injuries in scar tissue and break down collagen fibers which lead to scar remodeling. Recent researches have explained two mechanisms for ESWT. First, shock waves have effects on pain receptor physiology, and second, these waves can cause microtrauma and release growth and molecular factors which leads to tissue repair. There are limited studies on the positive effects of ESWT on burn scars and wound healing in various patients, but there is not enough evidence for efficacy of this type of treatment.,, According to the social and daily dysfunction of patients with burn scar and few limited studies on the effects of ESWT on burn scars, the aim of this study was to evaluate the effects of ESWT on improving burn scars in burn patient's extremities in Isfahan, Iran. 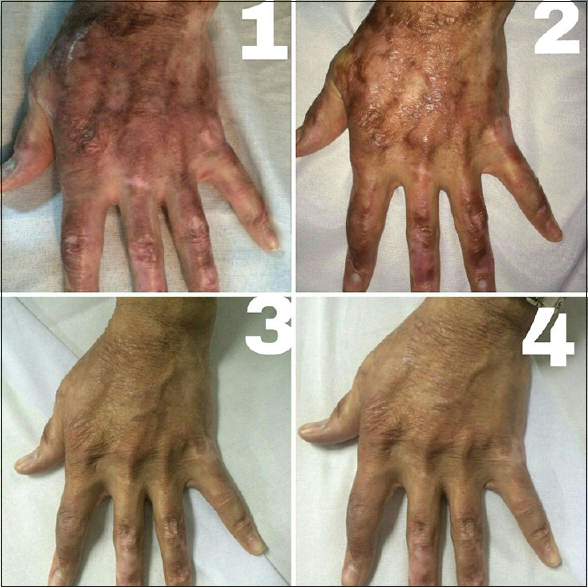 This study was a prospective quasi-experimental on burn patients with burn scar in their extremities who referred to Imam Musa Kazem Hospital of Isfahan University of Medical Science from 2016 to 2017 (IRCT2017012132091N1). The inclusion criteria were being older than 18, having burn scar in extremities, and willingness to participate in this study. Exclusion criteria were (1) burn scar on the face, thorax, neck, and genitalia, (2) pregnancy, (3) coagulopathy or cardiac pacemaker, (4) a history of chemotherapy or radiotherapy, (4) mental and physical disability, and (5) unwillingness to participate in this study. This study was approved by Regional Bioethics Committee of Isfahan University of Medical Science. Seventeen patients were selected to participate in this study based on the inclusion and exclusion criteria. All the participants were informed about this study and consent letter was obtained from them. At first, demographic data including age and gender were gathered by interviewing the patients. Then, visual analog scale (VAS) was used for evaluating patient's pain and itching from the scar; patients scored their pain and itching by a number between 0 and 10. Zero indicates very low pain and itching, whereas 10 means severe pain and itching. VAS is a simple and frequently used method for the assessment of variations in the intensity of pain or itching. Then, Vancouver Scar Scale (VSS) was used by the physician to evaluate scar appearance. VSS has four subscales including pigmentation (scores: normal  hypopigmentation , and hyperpigmentation ), vascularity (scores: normal , pink , pink to red , red , red to purple , and purple ), pliability (scores: normal , supple , yielding , firm , banding , and contracture ), and height (scores: flat , <2 mm , <5 mm , and >5 mm ). Digital photography from scars was performed for each patient. After collecting the data, patients underwent six sessions of ESWT during 6 weeks (once a week) by this setting: 0.1 j/mm2 energy, 100 impulses per cm2, 4 HZ frequency, and using focused probe. After finishing the treatment course, VAS and VSS were again used for each patient. Participants were followed 1 month and 3 months after finishing ESWT sessions using VAS and VSS. All the statistical analyses were performed using SPSS 21 software (SPSS crop., Chicago, IL, USA). Quantitative and qualitative variables were reported as a mean ± standard deviation and number and percent, respectively. Repeated measures analysis of variance was used as the main statistical analysis method. Sphericity assumption was checked using Mauchly's test. A two-sided α level of 0.05 was used to assess statistical significance. In this study, 17 patients were treated using ESWT with a mean age of 37.94 ± 7.25 years ranged from 22 to 48 years. From participants, 47.1% (n = 8) were male and 52.9% (n = 9) were female. The mean time passing from burn injury was 25.23 ± 41.49 months. The mean of VAS score for pain significantly decreased during the study periods. The mean of pain scores was statistically significant at the end of the treatment, 1 month, and 3 months after the end of the treatment. The mean of VAS score for itching significantly decreased during the study periods. The mean of itching scores was statistically significant at the end of the treatment, 1 month, and 3 months after the end of the treatment. The mean of VSS score for participants significantly decreased during the study periods. The mean of VSS scores was statistically significant at the end of the treatment, 1 month, and 3 months after the end of the treatment. The mean of VAS score for pain, VAS score for itching, and VSS score at different times of evaluation are shown in [Table 1]. 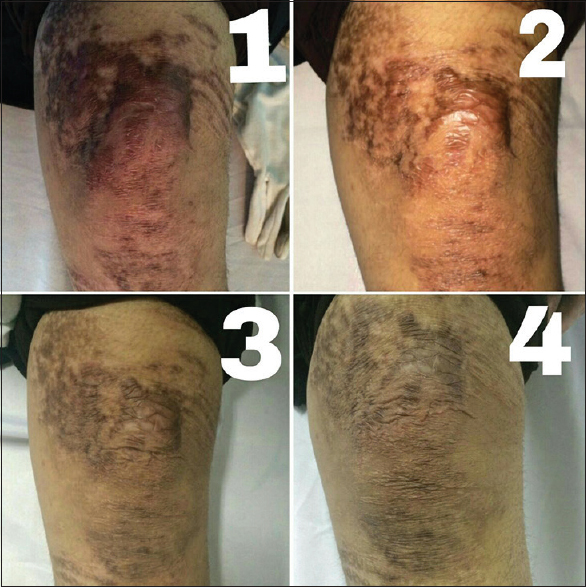 [Figure 1] and [Figure 2] show the appearance of scars of two patients with burn scar that underwent ESWT in this study. This study showed the efficacy of ESWT on improving the pain, itching, and the appearance of burn scar. After finishing the treatment, VAS score for pain and itching and VSS score were decreased significantly which showed the efficacy of this type of treatment immediately after the treatment sessions. Patients were followed up and their evaluation 1 month after finishing the treatment showed more improvement in pain, itching, and scar appearance. Following patients 3 months after the treatment did not show any significant changes in pain relief and itching, but the appearance of scar became better. Similar to our study, there was a research that evaluated the effects of ESWT on 16 patients with postburn scar contracture, hypertrophic scar, and keloids twice a week for 6 weeks. After the first session, scars appeared more pliable and color mismatch was decreased. At the end of the treatment, all the scars had more acceptable appearances. This study demonstrated that ESWT is a feasible, cost-effective, and well-treated modality for burn patients with burn scars. Another study evaluated the effect of ESWT on skin regeneration after deep partial thickness burns in rats and reported that ESWT improves reepithelialization and skin regeneration. Another study assessed 208 patients with soft-tissue injuries, nonhealing, and complicated wounds and showed that ESWT can induce wound epithelialization 2 weeks after the treatment and 75% of patients showed complete epithelialization after receiving ESWT. Evidences showed that blood flow is increased after undergoing ESWT during the 1st days and these shock waves can increase growth and angiogenesis factors. ESWT can immediately increase capillary perfusion in tissue and provide better blood supply and perfusion which prevent tissues from ischemia. Shock waves can stimulate tissue healing, decrease calcification, and inhibit pain receptors or denervate them which leads to pain relief. Shock waves improve early expression of angiogenesis-related growth factors including endothelial nitric-oxide synthesis, vascular endothelial growth factors, and proliferating cell nuclear antigen that develop new vessels which improve blood supply and cell proliferation and accelerate tissue healing and regeneration. ESWT decreases the number of macrophages and infiltrating neutrophils and suppresses pro-inflammatory cytokine and chemokine produced by cells in wound sites. Other studies reported that ESWT regulates the inflammatory process and stimulate fibroblasts to rebuild injured tissues. It can decrease pain and increase immune responses to acute injuries and reinforce immune system for chronic injuries., There has been another study that assessed ESWT on patients with chronic ulcers in lower extremities and showed that ESWT can improve healing of chronic ulcers. Studies have reported that normal wound healing has consecutive phases as followed: hemostasis, inflammation, debridement, proliferation, and remodeling. Chronic ulcers fail to complete all of these stages, and this problem is mostly in proliferation, inflammation, or debridement phases and when one phase fails to complete successfully, tissue epithelialization and regeneration remain incomplete. For evaluating the differences between the effect of ESWT on chronic and acute burn injuries, more researches are needed to compare these effects between two separate groups. Scar revision and management are a great challenge in medicine, and there are several studies that have evaluated alternative approaches and treatment for this problem. ESWT was used in lithotripsy for 30 years, and besides its mechanical effects, it has biological effects which has been reported 15 years ago by an orthopedic surgeon. There are few studies on the effects of ESWT in improving scar appearance and pain that most of them showed its efficacy. To use this modality for treating patients with burn scars, the need for more researches and evident outcomes is obvious. One of the strengths of this study was evaluating burn scars in extremities and showing the results for just burn injuries in extremities which are the functional organs in human body. Another one was prescribing ESWT sessions once a week in comparison to another similar study that has ESWT sessions twice a week for 6 weeks and showed similar efficacy. One of the limitations of this study was its small sample size which included only 17 burn patients. Another limitation was assessing patients with different time duration passed from their burn injuries together. For future researches, it is better to evaluate the effect of ESWT on greater sample size and compare this modality with other treatment modalities used for treating burn scars. One limitation of the present study was lack of a control group; so it is recommended that, in future studies, a control group would also be assigned for comparing the results of the treatment between both groups. ESWT can improve burn scar pain, itching, and appearance in human extremities in burn patients. ESWT is a well-tolerated and cost-effective modality for treating burn scar in extremities. Fioramonti P, Cigna E, Onesti MG, Fino P, Fallico N, Scuderi N, et al. Extracorporeal shock wave therapy for the management of burn scars. Dermatol Surg 2012;38:778-82. Esselman PC, Thombs BD, Magyar-Russell G, Fauerbach JA. Burn rehabilitation: State of the science. Am J Phys Med Rehabil 2006;85:383-413. Wainwright DJ. Burn reconstruction: The problems, the techniques, and the applications. Clin Plast Surg 2009;36:687-700. Wang CJ, Wang FS, Yang KD, Weng LH, Hsu CC, Huang CS, et al. Shock wave therapy induces neovascularization at the tendon-bone junction. A study in rabbits. J Orthop Res 2003;21:984-9. Meirer R, Kamelger FS, Huemer GM, Wanner S, Piza-Katzer H. Extracorporal shock wave may enhance skin flap survival in an animal model. Br J Plast Surg 2005;58:53-7. Wang FS, Wang CJ, Huang HJ, Chung H, Chen RF, Yang KD. Physical shock wave mediates membrane hyperpolarization and ras activation for osteogenesis in human bone marrow stromal cells. Biochem Biophys Res Commun 2001;287:648-55. Schaden W, Thiele R, Kölpl C, Pusch M, Nissan A, Attinger CE, et al. Shock wave therapy for acute and chronic soft tissue wounds: A feasibility study. J Surg Res 2007;143:1-2. Delius M. Biological effect of shock waves – More than “just” lithotripsy? Zentralbl Chir 1995;120:259-73. Wang CJ, Huang HY, Pai CH. Shock wave-enhanced neovascularization at the tendon-bone junction: An experiment in dogs. J Foot Ankle Surg 2002;41:16-22. Rezasoltani Z, Najafi. S, Azizi S, Forough B, Maleki N, Fateh H. The comparison of Shock Wave therapy and Corticosteroid injection on the treatment of Plantar Fasciitis. Ann Mil Health Sci Res 2013; 11:53-60. Djedovic G, Kamelger FS, Jeschke J, Piza-Katzer H. Effect of extracorporeal shock wave treatment on deep partial-thickness burn injury in rats: A pilot study. Plast Surg Int 2014;2014:495967. Meirer R, Kamelger FS, Piza-Katzer H. Shock wave therapy: An innovative treatment method for partial thickness burns. Burns 2005;31:921-2. Moretti B, Notarnicola A, Maggio G, Moretti L, Pascone M, Tafuri S, et al. The management of neuropathic ulcers of the foot in diabetes by shock wave therapy. BMC Musculoskelet Disord 2009;10:54. Carlsson AM. Assessment of chronic pain. I. Aspects of the reliability and validity of the Visual Analogue Scale. Pain 1983;16:87-101. Baryza MJ, Baryza GA. The vancouver scar scale: An administration tool and its interrater reliability. J Burn Care Rehabil 1995;16:535-8. Meirer R, Brunner A, Deibl M, Oehlbauer M, Piza-Katzer H, Kamelger FS. Shock wave therapy reduces necrotic flap zones and induces VEGF expression in animal epigastric skin flap model. J Reconstr Microsurg 2007;23:231-6. Rompe JD, Hopf C, Nafe B, Burger R. Low-energy extracorporeal shock wave therapy for painful heel: A prospective controlled single-blind study. Arch Orthop Trauma Surg 1996;115:75-9. Wang CJ. An overview of shock wave therapy in musculoskeletal disorders. Chang Gung Med J 2003;26:220-32. Davis TA, Stojadinovic A, Anam K, Amare M, Naik S, Peoples GE, et al. Extracorporeal shock wave therapy suppresses the early proinflammatory immune response to a severe cutaneous burn injury. Int Wound J 2009;6:11-21. Arnó A, García O, Hernán I, Sancho J, Acosta A, Barret JP. Extracorporeal shock waves, a new non-surgical method to treat severe burns. Burns 2010;36:844-9. Saggini R, Figus A, Troccola A, Cocco V, Saggini A, Scuderi N, et al. Extracorporeal shock wave therapy for management of chronic ulcers in the lower extremities. Ultrasound Med Biol 2008;34:1261-71. Loots MA, Lamme EN, Zeegelaar J, Mekkes JR, Bos JD, Middelkoop E. Differences in cellular infiltrate and extracellular matrix of chronic diabetic and venous ulcers versus acute wounds. J Invest Dermatol 1998;111:850-7.